Look at this burning stack o’ love! Cheesy, melty, filled with goodness and a perfect way to cap off the summer. There is nothing else I want to share with you right now. Except perhaps a cocktail. This is the second recipe I’m sharing in partnership with Pernod Classic. I’m loving this liqueur more and more by the day – the recipe ideas I have right now are endless. Two weeks ago we used it to deglaze a pan of honey-coated chicken and it’s probably my favorite use yet. It adds SUCH a ridiculous amount of flavor. Can’t even take it. 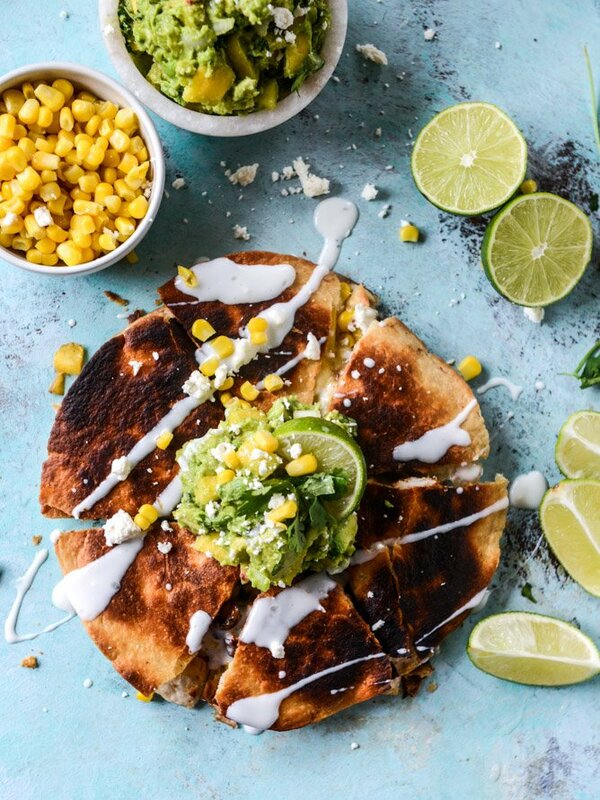 Quesadillas are one of those things that we always forget about here until we have a lot of leftovers and absolutely NO idea what to do with them. It almost always happens as such: Eddie and I will go back and forth on what the heck we should have for dinner, we can’t think of anything but we have lots of leftover chicken. I quickly throw together quesadillas five minutes before he gets home and with one bite, we’re both like WHY don’t we have these more often? Late 2016 goal: have them all the time. Good news! If you don’t have any leftover chicken, you can make a delicious version super quickly right on your stovetop. I chopped up a chicken breast and cooked it in a touch of butter and honey and then deglazed the pan with Pernod Classic, which added a very slight, almost spiced anise flavor. It added a pop of something that an otherwise boring chicken quesadilla just needed, you know? Sidebar: Max never stops asking for “deeee-yas” now (I usually make his with cheese and chopped veggies) and it’s the cutest thing ever. 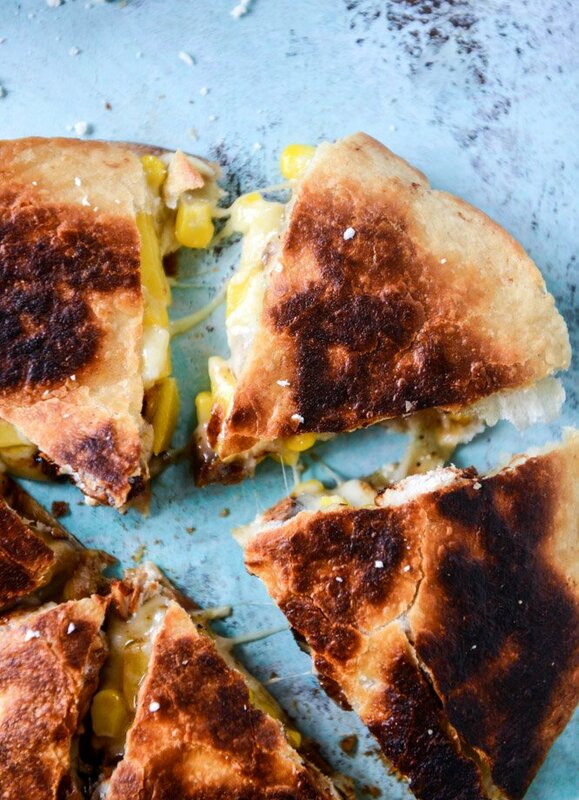 Another reason to make more quesadillas, obviously. Inside, I added some melty Monterey jack cheese, some quick salsa and a chopped up peach. It tastes like summer and not only compliments the Pernod, but also compliments the peach guacamole. 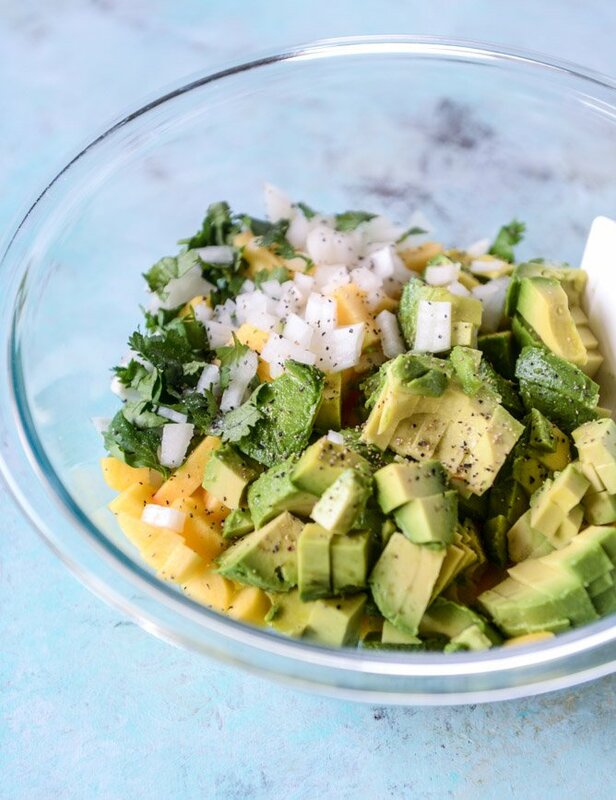 We are talking fresh peach guacamole, made completely with some sweet onion, jalapeno, cilantro, lime juice and cotija cheese. Just give me a spoon please and thank you. I don’t even know if I need a chip! Heat a large skillet over medium- high heat. Season the chicken with the salt and pepper. Add the butter and olive oil to the skillet. Once melted, add the chicken and cook until golden on all sides – cook for 5 minutes, then flip and toss and cook for 5 minutes more. Drizzle the honey over the chicken and toss. Turn the heat down to medium. Add the Pernod to deglaze the pan, tossing the chicken well. To assemble the quesadillas, add some cheese on the bottom of the tortilla. Fill with half of the chicken, half of the peach and corn. Add another sprinkling of cheese and the top tortilla. Repeat with remaining ingredients. Heat either the same skillet or a large griddle over medium heat and add a touch of butter to coat the bottom. Place the filled tortillas on the surface and cook until the tortilla is golden and crisp and the cheese is melted. 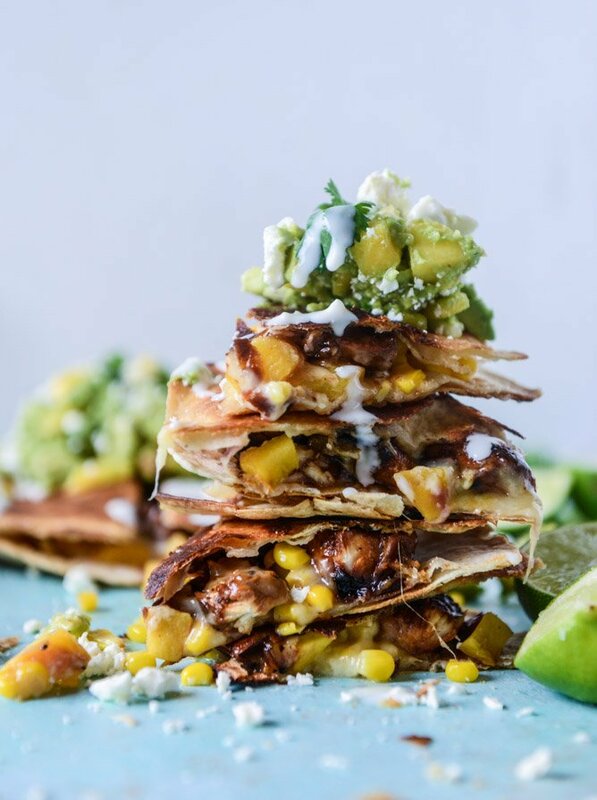 Slice and serve with the peach guacamole and a drizzle of crema. Mash the avocado in a bowl. One mashed, stir in the peach, pepper, onion, cilantro and lime juice. Add in the salt and pepper and mash. Taste and season additionally if needed. Who am I kidding. Of course I need a chip. This sounds amazing! I’m pretty sure I would even eat this for breakfast. YUmmy! 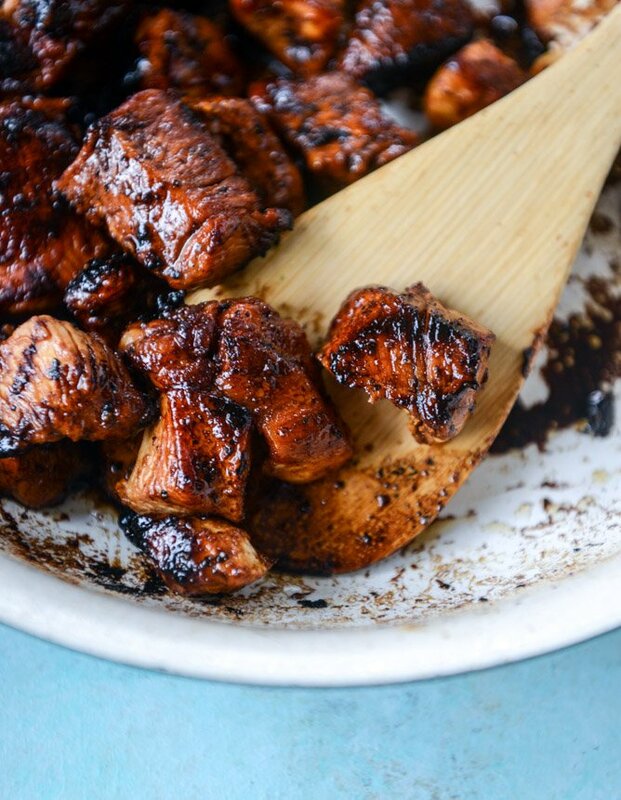 I loved glazed chicken recipes, it gives it a little extra flavor. My Friend just told me about this easiest method of earning money from home. I’ve just tried it and now I am making $4500 per month withoutt spending too much time. you can also learn about this trick by the link below…….. 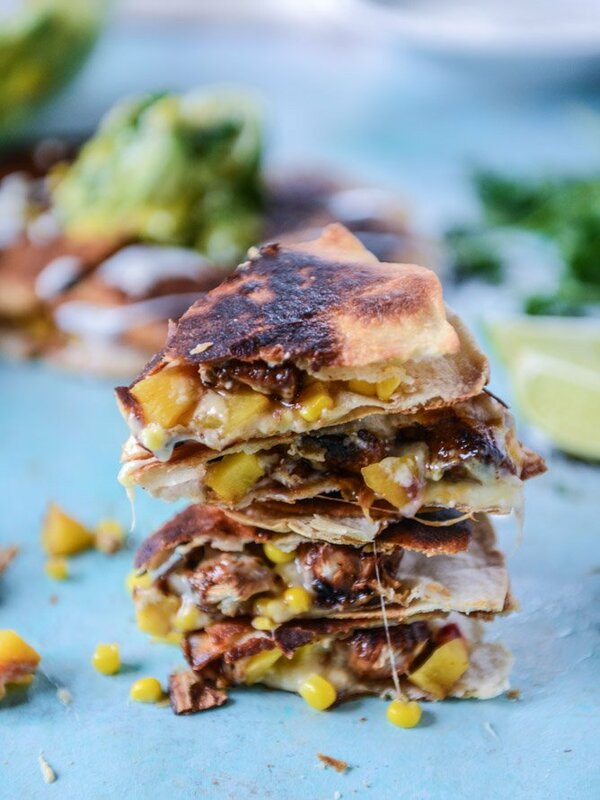 I usually find most quesadillas to be pretty boring… but not this fantastic creation! That peach guac is a fabulous addition! Love your chicken recipes, always looking for ways to change it up w/ the chicken. I could live off spoonfuls of that guacamole and chips for the rest of the summer… oh and of course cold margaritas. OH my, my, MY!!! These look to die for. Seriously, I may try to eat the screen! This looks and sounds soo delicious! I’m making it SOON! Your recipes are always so amaziing! Wow. Feed me this every day for the rest of my life and I’d be one happy camper. These look perfectly packed with flavor and deliciously crispy! the combinations i throw together with my fridge of produce do not always turn out so delicious… hahaha. Is that blue-green background your kitchen countertop? Stunning! This will be haunting me until I try it! The peach sounds like such a perfect addition. anything anise – liquor, or even a soda, would work!! 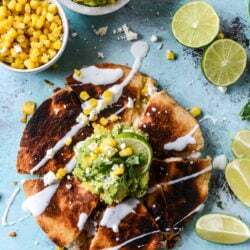 Pingback: Weeknight Meal Plan #7 || Summer Flavor Sneak Peek - The Effortless Chic - A lifestyle blog bringing easy ideas for every day style to you, every day of the week!